GOLD PRICES failed to hold a $5 overnight rally in London trade Tuesday morning, slipping back below $1240 per ounce as US Federal Reserve chief Jerome Powell prepared to appear before Congress to speak on monetary policy. Ahead of Powell’s semi-annual testimony, betting on the Fed raising its key interest rate twice more in 2018 rose to a new record, with more than 60% of speculative positions on CME interest-rate derivatives now forecasting a hike to 2.5% or above by year’s end. Higher rates and thus a stronger Dollar “naturally presents a downside risk for gold prices,” says a new gold-price analysis from Chinese-owned investment and bullion bank ICBC Standard. 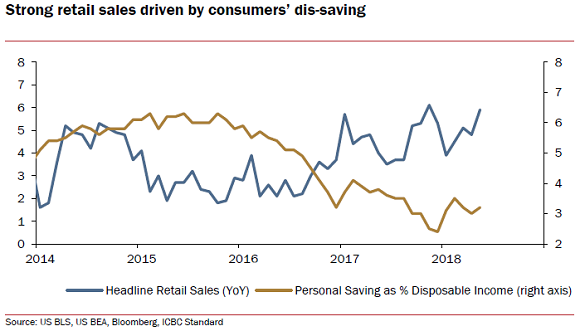 “Our major concern is [how strong retail sales growth] has been driven by consumers spending more at the expense of saving less,” writes ICBC Standard’s analyst Marcus Garvey. “The risks to the gold price from spill-over effects from ongoing trade tensions [meantime] appear fairly evenly balanced,” ICBC Standard goes on, trimming its 2018 annual average gold price forecast to $1299. London’s afternoon benchmark price has so far averaged $1312 per ounce since New Year, a rise of 4.3% from the full-year average in 2017. “Tariff increases by the United States and retaliatory measures by trading partners…could derail the [global economic] recovery and depress medium-term growth prospects,” says the latest global outlook from the International Monetary Fund. Today the European Union signed a new free trade pact with Japan, aiming “to lead the world by bearing the flag of free trade,” according to Japanese Prime Minister Shinzo Abe. The Euro currency touched 1-week highs versus the Dollar before easing back, keeping the wholesale spot gold price in Euros below €1060, a new 7-month low when first hit yesterday. A day after US President Trump said Russia’s President Putin “was extremely strong and powerful in his denial” of meddling in the 2016 US election, UK campaign group Vote Leave was today fined £61,000 and referred to the police for breaking electoral law in the 2016 Brexit referendum. Twenty-six Russian nationals have now been charged with interfering in November 2016’s US election. The British Pound today fell over half-a-cent as wrangling continued in Parliament between the ruling Conservative Government and its own ‘hard Brexit’ MPs. Self-declared ‘stop Brexit’ party the Liberal Democrats yesterday saw only 9 of their 12 MPs attend a key vote on Prime Minister Theresa May’s new post-Brexit proposals for the UK’s trading relationship with the EU. Both current LibDem leader Vince Cable and former leader Tim Farron were absent. Gold priced in Sterling rose as the currency fell Tuesday, regaining yesterday’s 0.7% slip to 3-month lows to trade back above £940 per ounce.